The 4 x 3 Jasmine Tower and Slide Playhouse would serve as the perfect first playhouse for a younger child. It is very well made and has passed numerous child safety tests so your kids are going to be safe playing on here. The actual playhouse is a good size and offers plenty of room for toys, a little table or even a funky tea party for your child and their little friends. This is a very well made decking area where they can sit and play and when they are in the mood to go a little crazy there is a fun slide which can be positioned in numerous positions. 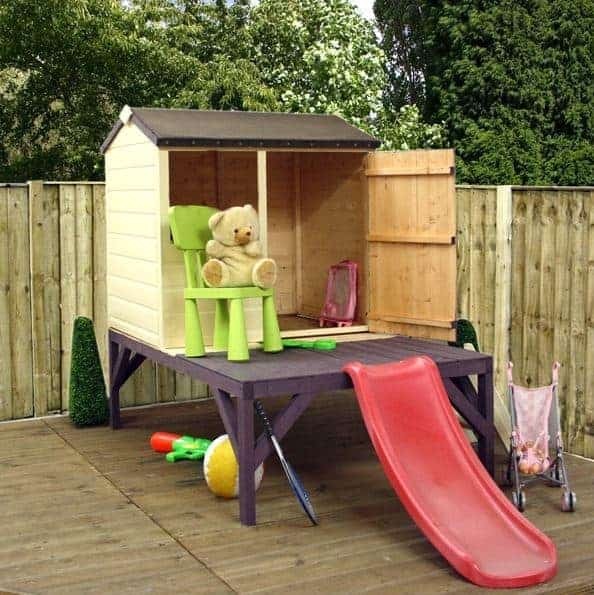 Even though this is one of the cheaper playhouses from Waltons they have still made it with the same care and attention to detail as all their others. The walls are very robust thanks to being made with some great looking tongue and groove shiplap cladding and backed up with a solid frame. The floor and the roof is made using their solid sheet boarding which as well as being very strong also helps in keeping costs down. That lovely little door has been made so that it can take a slamming and it has also been given a little space so that there is no way for them to trap their fingers. The 4 x 3 Jasmine Tower and Slide Playhouse is an ideal compact playhouse for younger children. This is something that would work very well as a child’s first playhouse. The whole structure is not all that huge so even more smaller sized gardens should be fine with this. The total size is 9 feet 11 inches in its depth and, 5 feet 1 inch in its width. The actual playhouse is a good size for younger children at, 3 feet 9 inches wide and 2 feet 11 inches in its depth. This is more than enough room for them to put a whole load of toys in here. The height along the ridge is 3 feet 10 inches and the eaves height is 3 feet 1 inch so there is more than enough headroom for them to be able to walk around comfortably inside here. Of course a main feature of this playhouse is that fun slide. This is a smaller sized slide that is made for younger children to enjoy. What we love about this is that, you can position the slide in a few different positions so it can be placed where is most convenient for your garden. If you look at the picture close enough then you will see that there is a small ladder right next to where the door goes. This is a child slide ladder and we are sure they will have a lot of fun climbing up and down it. A sand felt covered, 8 mm thick solid sheet board apex roof is going to keep the rain out and also be able to handle a heavy blanket of snow. We are very impressed with how this roof is just as high quality as the roofs on other more expensive Waltons playhouses. This is a playhouse that just has a very adorable look to it. 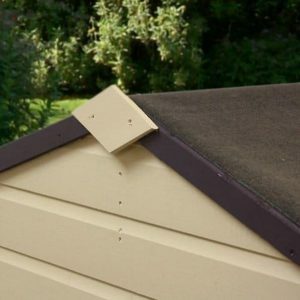 The 12 mm thick tongue and groove shiplap cladding has been very cleverly designed and as the wood is nice and smooth there is no worry about the kids getting a splinter or the wood having any issues. Inside the playhouse, Waltons have made sure that the frame is just top of the line in every regard. Despite this being a cheap playhouse, they have used their very impressive round edged framing. This frame is very robust and will allow the playhouse to take quite a bit of abuse over the years. 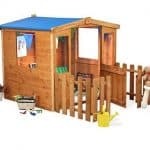 Little kids always seem to like to bash stuff so at least you know this playhouse is going to be able to take a beating with a toy spade, hammer or fire truck. As is the case with other Waltons playhouses, this one uses the same solid sheet boarding for the floor as it does the roof. This is strong enough to take whatever shenanigans the kids get up to inside. 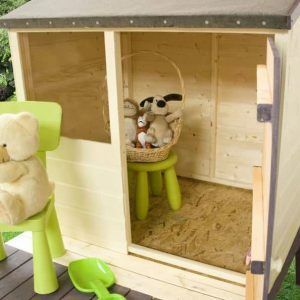 The decking outside the playhouse is made with stronger tongue and groove boards which considering the low cost of the playhouse is quite impressive. The playhouse will be sent to you unpainted, but the wood will be given a base coat treatment to protect it during transit. To keep the playhouse free from rot you will need to give it a coating of wood treatment. Doing this within the first week of installation is always the best way to go if you ask us. Waltons will give you a free 5 litre tub of golden brown wood treatment which is a very welcome bonus. One way to make sure you get many years out of this playhouse is to treat it on a yearly basis. There is a ten year guarantee, but you must treat the playhouse in order for it to be valid. The 4 x 3 Jasmine Tower and Slide Playhouse has a 1 foot 9 inches wide, 2 feet 11 inches high door that is the ideal size for young children. As kids fingers seem to be magnets to getting trapped in doors, Waltons have made sure that there is a little space around the door so their fingers are safe. There is a large open window that has no glass or styrene in it. This will let the kids look out, throw things in and out and in general it is just a pleasant little feature. Still we would have liked to have seen something here to protect the inside from the rain. This is not the kind of playhouse you would want your children leaving expensive things in as it is very open. As well as there being that wide open window there is no lock on the door which to be fair is not an issue as a lock on a child’s playhouse can be a bit of an annoyance when the kids cannot unlock it themselves. This is not a structure that offers much in the way of privacy, but as this is designed for younger children we will not slate it for this. As we mentioned before you can actually move the slide to a few different locations on the decking. This may not sound like much, but Waltons are not normally known for allowing any customisation with their playhouses so the fact you can even do this is quite remarkable. There is an installation service that is available as an extra. 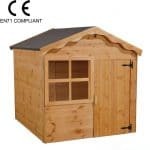 It is priced at, £109.99 which is over half the price of the playhouse so it is rather expensive. 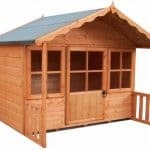 We will be honest and tell you that when we first saw the price we thought for sure this would be a lower quality than some of their other playhouses. 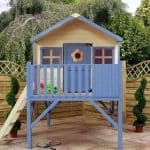 However this is just as well made as some of Waltons other playhouses that cost double the price. As long as you keep the wood rot free by treating it after construction and on an annual basis then most likely the kids will get too big for this before it starts showing any signs of wear and tear. This is a small playhouse, but it is kind of harsh for us to be critical of it because of this as it is made for smaller, younger children. So in that regard the playhouse is actually a very good and ideal size. 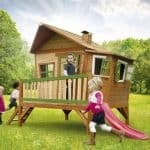 There is not a whole lot to this playhouse so you and a friend as long as you follow the instructions should not have any trouble building this. We can just imagine how much fun your kids are going to have playing with this. At just under £200 and with how high quality it is, this really is something that is excellent value for money. Final Thoughts: The 4 x 3 Jasmine Tower and Slide Playhouse may be seem like a rather basic playhouse, but as a young child’s first playhouse, you will have a hard time finding a better made and higher quality playhouse than this. While this is something that they are going to have a lot of fun with be it going down the slide or playing with their toys inside it, you as a parent will love just how sturdy and safe it is not to mention that it is going to last for many years as well. 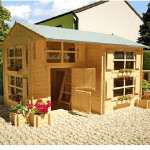 In all this is a playhouse that has impressed us a great deal and if you are looking for a high quality, well made playhouse for you kids then this one deserves some serious consideration.